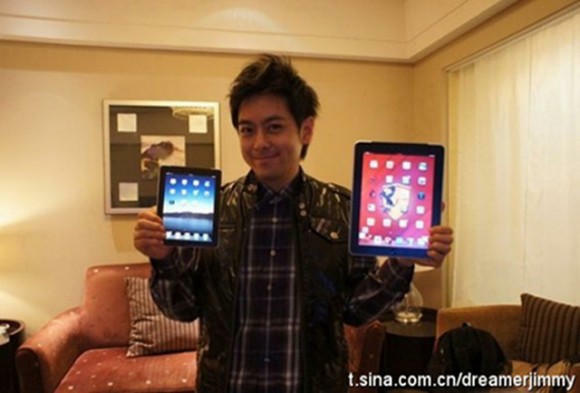 The man in the picture above is Jimmy Lin, and he’s convinced that the device he is holding in his right hand isn’t some obvious knock-off product, but the actual next-gen iPad Mini. Is he right? Well, there’s zero evidence to go by, but I’m going to say no. Steve Jobs has been disingenuous about Apple’s future plans before, but usually so as not to tip off the competition. Given that seven inch tablets are already a reality, there’s no reason for him to rail against the form factor if he’s secretly planning an entry into the same space with an iPad Mini. Our guess here is that Lin has been fooled by a knock-off (a theory that may be supported by the lack of third-party apps on the iPad Mini, implying a limited but realistic skin job) but only time will tell.